Former Manchester United and Aberdeen winger Ben Thornley, who was part of the famous Class of '92. Ben Thornley has many regrets from his football career. The regular drinking sessions, the womanising, the failure to usurp past glories and grace the highest level again once his Manchester United career had petered out. One thing you will not find on that list, however, is his time in Aberdeen. For it gave him a son. Thornley met his first wife, Claire Robertson, in the Granite City and she is the mother to his 14-year-old son, Lucas, a glinting diamond in his life that would not have been found but for his venture north. It is a symbolic and emotional reminder of his time in Aberdeen, which at 18 months was by no means a lifelong commitment. But fresh after leaving Huddersfield Town and needing a new destination to prolong his career, Aberdeen proved to be a tonic. His time at United, infamously, was derailed by a tackle from Blackburn Rovers’ Nicky Marker in a 1994 reserve game that shattered his knee and saw him sue for damages. Hailed as one of the standouts of the Class of ‘92, alongside the likes of Paul Scholes, David Beckham and Gary Neville, Thornley was nursed back to fitness but never lived up to that early promise. Huddersfield provided an enjoyable environment to play football again, come 1998 when he finally left Old Trafford. However, it was not until he joined the Dons that he finally cut ties with home and branched out on his own. 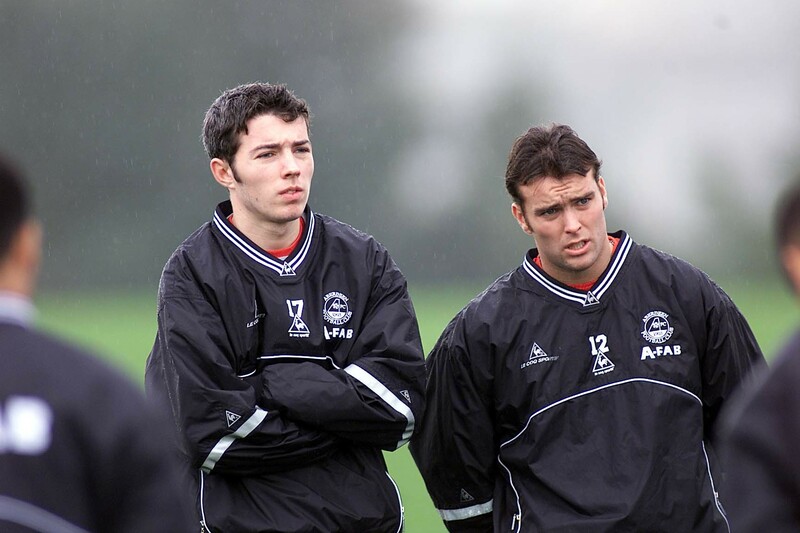 Thornley and Kevin McNaughton during an Aberdeen training session. “I went on trial at Reading and they made no secret of the fact they were holding out for one other player. By the time it took them to decide I wasn’t for them, I had been contacted by Aberdeen to come up for a trial match as they were interested in signing me. I had a couple of training sessions and scored in a bounce game and was in the team against Hearts. 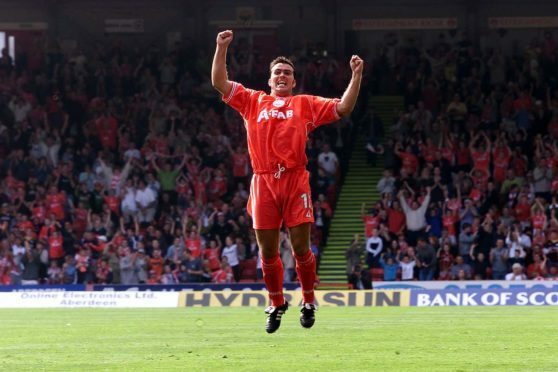 I scored on my debut at Pittodrie against Motherwell, which I will always look back on fondly. “I was close to Derek Whyte, Darren and Derek Young, and Jamie McAllister and David Preece were good friends of mine. Derek Whyte and I lived in the same apartment block. I got on with everyone; they were a cracking group of lads and they all made me feel welcome. Thornley’s relationship with then-manager Ebbe Skovdahl had its ups and downs. While he was the man who gave him his chance in the Scottish Premier League, he was also the one who brought his time in Aberdeen to a premature end. “I had no inkling whatsoever why I was being left out but Ebbe was planning on leaving as well. That would have swayed my decision if I knew. Steve Paterson and Duncan Shearer took over and I did a week’s training them. They tried to convince me to stay, as everyone was starting from scratch, but I told them I was given a few days grace to sort out a contract with Blackpool. Thornley left Aberdeen during the 2002-03 season. That era prompted some of Thornley’s more regrettable moments off the park and offer an insight into why he feels his standards dropped. “Ebbe gave us the Monday off, which was an odd day. That meant we were sort of free for the whole weekend. I’m not suggesting it was week in, week out, but when I say I could have done things a bit differently, that stands out. I didn’t have a partner and it was the first time I had lived away from friends and family. When you’re in your mid-20s, you maybe don’t realise when you should have been staying in and working on other things, rather than taking solace in going out and having a drink.